The Fiber Broadband Association's Fiber Certification recognizes operators for their commitment to ensuring customers receive the fastest, most reliable broadband services—connectivity delivered over "future-proof" fiber networks. Why become a certified fiber network operator? Consumers and businesses everywhere are clamoring for the fastest, most reliable broadband service. Fiber broadband is the proven gold standard. This certification program is designed to help our fiber network operator members highlight the critical work they are doing to bring all-fiber connectivity to those they serve. It's a way to identify those who are truly bringing the best to their communities. "Strategic Commitment" is defined as the ratio of the total number of residential households to which fiber services are marketed divided by total residential households to which services are marketed, all within the operator's entire local access network. Ex: if you market fiber to 90,000 households within a 100,000 household network, you are qualified to be All-Fiber. Not a member, but interested in certification? 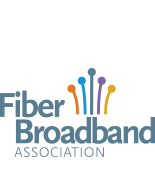 Join the Fiber Broadband Association. Already a member? Apply for All-Fiber Certification or Fiber Certification. Contact Ancilla Brady at abrady@fiberbroadband.org or call 202-524-9552.